Pediatric residency graduates are increasingly asked to provide procedural sedations. Currently, most programs provide minimal exposure to residents outside of PICU for procedural sedations. We describe the pediatric sedation and analgesia (PSA) evolution and resident experience over the past 6 years at our institution (fiscal year 2010–2015). Administrative database of the PSA team and resident evaluations obtained by respective residency programs were analyzed and presented with standard descriptive analysis. Commutative or where appropriate year-by-year data were analyzed. Over the past 6 years, 100 residents performed 1,742 sedations with 17 ± 6.4 sedations per resident. Lumbar puncture and MRI were the most frequent procedures for sedations performed by residents. There was no statistical difference in complication rates in sedations performed by residents (28.6 ± 16.6) versus those by attending only (36.2 ± 31.2). Overall, residents were satisfied with the educational experience with an average score of 6.1 ± 0.17 out of maximum 7. 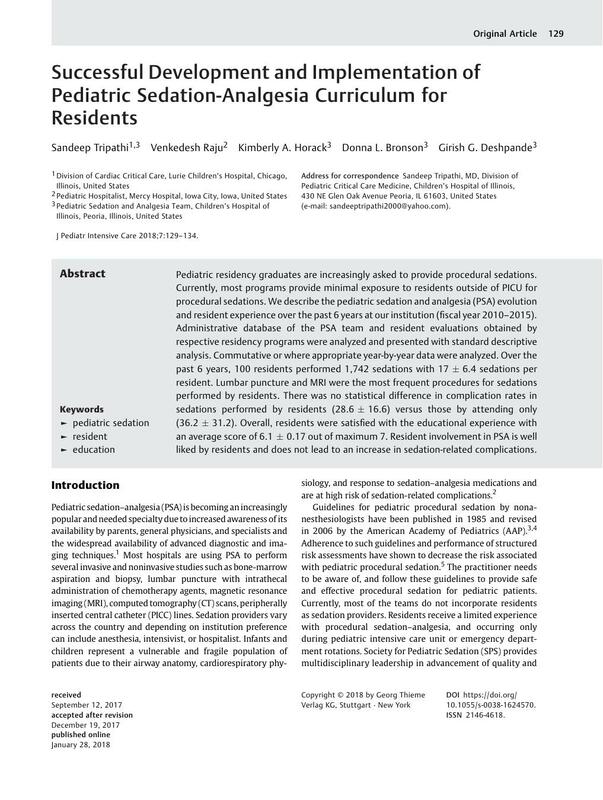 Resident involvement in PSA is well liked by residents and does not lead to an increase in sedation-related complications.